Hand drying results that will blow you away. Get the ultimate in hand dryer technology with our range of automatic, commercial hand dryers. Get amazing results while saving energy with a MAXBLAST automatic hand dryer. 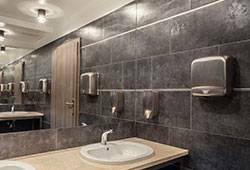 Utilising advanced hand drying technology, our hand dryers offer hygienic, fast and powerful hand drying for commercial spaces anywhere. Perfect for bathrooms, toilets and WCs in pubs, clubs, hotels, coffee shops, offices, restaurants, cafés, cinemas, theatres, gyms and more, invest in one of electric dryers for years of reliable results. Our range is aesthetically appealing as technically sound, balancing a powerful motor for faster drying with a minimal sound level of around 72db - comparable to an average vacuum cleaner. Every order comes supplied with all the necessary fixtures to mount and install the dryer quickly and easily. All of our hand dryers come with free delivery to mainland UK (excluding Scottish Highlands) and our amazing MonsterShop 12 month electrical warranty.